I don’t dabble that much in colouring books, in part because I frequently end up colouring for work purposes. However, I was asked if I’d review this, and I said yes, for the simple reason that creator Sarah Snell-Pym is a very lovely person. She’s also got what I can only describe as a unique mind, and as a consequence what she’s made is a truly unusual colouring book. 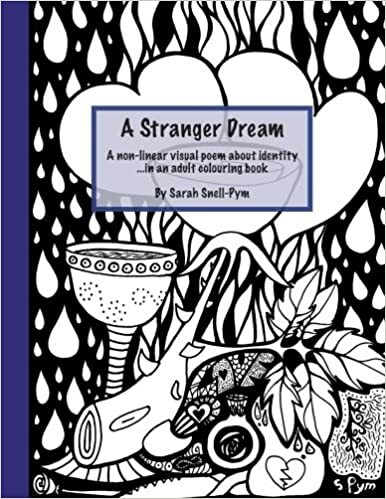 The front cover describes it as ‘a non-linear visual poem about identity… in an adult colouring book.’ The poem is embedded in the images and you have to find the words, some of them are more obvious than other. That calls for a deep engagement with each page, and it gives a strange coherence to the book as a whole. The art is only on one side of any given sheet of paper. This means that by colouring in one image, you don’t mess up another one – especially an issue if you want to use pens or inks. There’s a lot of variance in terms of how much of the page you are offered for colouring. Some pages have a lot of open space, encouraging you to do your own thing. Some pages have a lot of black on them, so you don’t need to do much to get the whole image. I like this. It creates room to decide what you’re equal to. Sarah’s art style is playful, and easy to get into. One of the things that stuck out for me is a reoccurring image of two unhappy blobby beings who merge in the middle. A personification of dysfunctional co-dependency, I thought. Two beings with no proper boundaries, or one identity being subsumed by the other. They connect with the relationship and identity angles in the poem. if you look closely, you can see them co-blobbing at the bottom of the book cover. This entry was posted on Sunday, May 20th, 2018 at 10:30 am	and tagged with art, book, colouring, review and posted in Reviews. You can follow any responses to this entry through the RSS 2.0 feed.